Our friends at ZOOM have some great ideas for paper. 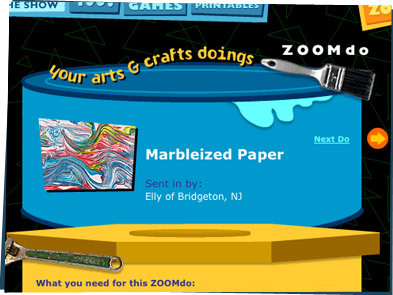 They show you how to marbleize paper and even how to make your own paper. But for gift wrap you can even just use the Comics section from the Sunday newspaper. That's what I used for Hector's present. Hey, Dex. Have you seen the Comics section from the Sunday newspaper? I was just about to read it. It's the highlight of my week. Er, no. I think Izz had it. Or Granny. Or the dog ate it. That dog we were going to get, but didn't. THAT dog? Yes, that's the one. Bad dog!